Who doesn’t like lemons? Lemons can be used in many different purposes. 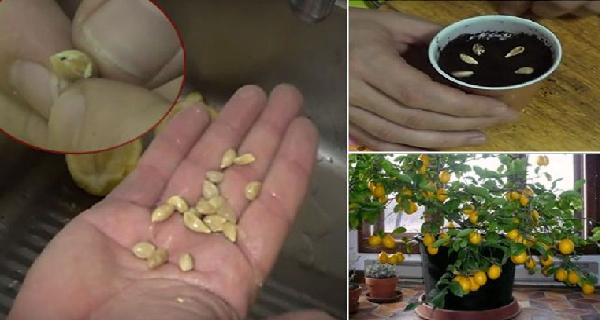 In this article you can learn how to grow your own lemon tree from seeds. Buy some organic lemon from the market. Since the lemon trees are often grafted, the wild lemon tree is grown from the seed. It should be used as a base on which you will graft the fruit-bearing species which will be rich in yellow and large lemons. Remove the seeds from your lemon. Make sure you don’t cut the seeds with your knife because they cannot be used anymore. Remove the pulp from the seeds by washing them with water. Separate the seeds in half with your fingernail. Plant the seeds in some small bowl and water the soil. Keep the soil moist by covering it with paper towel. Once your plant grows bigger, you can place it in the ground. Why are lemons good for us? Lemons are considered as a super-food. They can be used for many different purposes. If you like lemons, you should have one lemon tree in your yard. They are loaded with vitamin C, which is in the form of citric acid. It enhances the absorption of calcium in the digestive system. They are rich in unique flavonoids and antioxidants that fight against free radicals and prevent cancer. These antioxidants also protect our cardiovascular health and strengthen the immunity. They are helpful in treating urinary tract infections and many other issues related with the digestive system. Lemons are natural antiseptics for treating cuts. Since lemons are loaded with vitamin C, you should consume it moderately in order to prevent any intestinal disturbances and diarrhea. If you think this is an interesting post, please SHARE! Next post: NATURAL POTION THAT CURES MIGRAINE – Migraine Disappears Within 10 Minutes! Previous post: 8 CRUCIAL KIDNEY-FAILURE SYMPTOMS THAT MOST PEOPLE IGNORE!